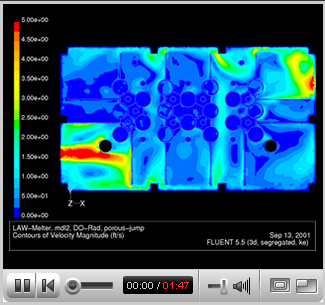 Flow Simulations provides CFD modeling on a consulting basis. Since our founding in 1994 we've performed hundreds of CFD models and take pride in offering a very high quality of work. We concentrate solely on CFD modeling and can provide an estimate on the number of hours required to finish your project. We use the Fluent Inc. solvers and have perpetual licenses for several parallel processes. This gives us the opportunity of having a very long term background with Fluent as well as lowering our cost to provide simulations. If you have any questions about the modeling, please give us a call and we can try to help. We always treat your information on a confidential basis. Flow Simuations, Inc. can provide an estimate on the total costs for a simulation project or we can work on an hourly basis. Also we can work on any aspect of a CFD project: whether this would be generating the grid, running the solver cases, or post processing and interpreting the results. Since our purpose is to use CFD to solve your problems, we place a lot of emphasis on making the results very clear and understandable. Additionally we are always happy to supply the geometry and solver files on CD-ROM. Copyright. Flow Simulations, inc. All Rights Reserved.